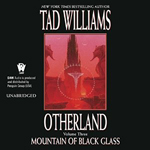 Mountain of Black Glass is the third volume of Tad Williams’s highly acclaimed four-book series, Otherland. A truly unique reading experience combining elements of science fiction, fantasy, and techno-thriller, it is a rich epic tale in which virtual reality could prove the key to a whole new universe of possibilities for the entire human race – or become the exclusive domain of the rich and the ruthless as they seek a technological pathway to immortality. The sequel to City of Golden Shadow and River of Blue Fire, this is the third installment (of 4) in the Otherland series. As with River of Blue Fire, Mountain of Black Glass picks up where the last one left off. 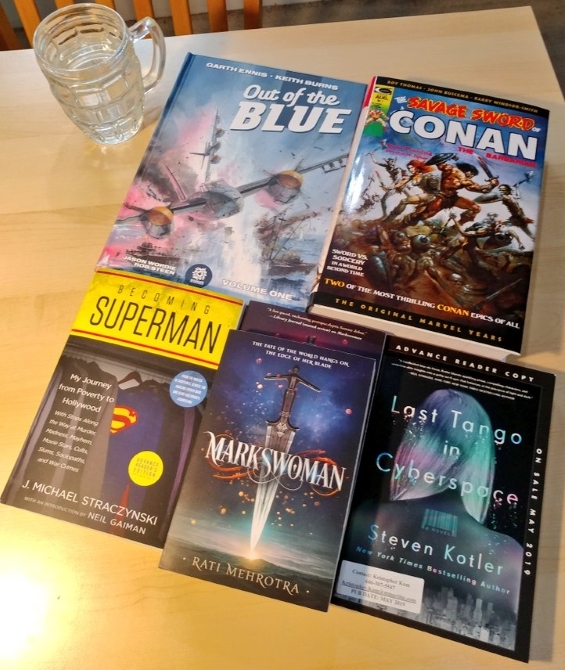 Where I rated River of Blue Fire 3 stars (it was a solid “middle book” in a series), this one gets 4 because of the time spent in Greek mythology, something I’ve always loved. 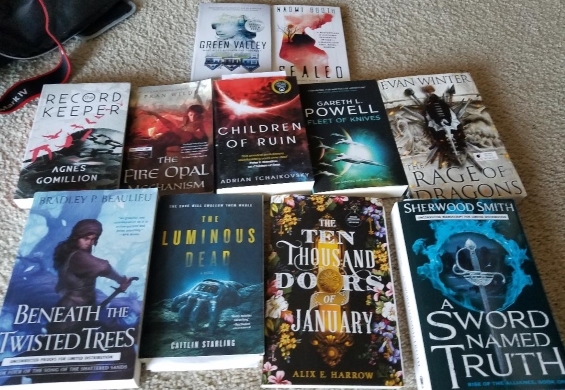 As a “middle book” in a series, it’s hard not to say things about Mountain of Black Glass that I didn’t say in my reviews for City of Golden Shadow or River of Blue Fire. The story started with key characters still separated (as they were at the end of River of Blue Fire), though much of the book was spent either a) moving them back together, b) exploring their pasts, learning more about their history, or c) giving the reader more insight into the Otherland network itself and the motivations of the people running the network. Unlike River of Blue Fire, in this book, many details seemed to “finally” be pieced together, so more complete histories of characters were formed. It was also a transformative time for some of the Otherland network owners/operators, as they put the final pieces together to try to gain immortality. Other characters, such as the psychopathic servant of the Otherland founder also get a lot of time in this book, as do the police officers looking into his murderous ways. Sellers, the old man who remains quite a mystery but seems to be some of the force that brings the heroes together, also has a key storyline, though it took quite a different turn from what I expected going into the story. An adventure from proverbial cover to cover (since I listened to the audiobook), a lot of time in this book was spent with the characters all trying to reach the Otherland‘s version of Troy. One of the characters is actually Odysseus, while others play key characters in the Trojan War, including Achilles, his companion Patroclus, and even Diomedes. The character who became Odysseus was forced through the Otherland simulation to re-enact Odysseus’ story somewhat in reverse, having seemingly gone through the events of The Odyssey prior to living through the Trojan War, as told in The Iliad. Our other heroes also eventually ended up in Troy, but not without enduring some trying circumstances in a few different worlds. As one might expect, though, these experiences allowed them to learn more about the network itself, and will undoubtedly help them in their quest to overthrow the Otherland founders (The Grail Brotherhood) and save the children who seem to be trapped by the network. It’s not all sunshine and roses, though. After finally learning more about each character, becoming significantly more invested in each of them, it seems that one or more of them may have actually died through the course of the narrative. It’s hard to tell for sure, and I suspect I’ll find out what exactly happened when I finish the series with Sea of Silver Light, but the emotional gut punch was harder than I expected it would be. It’s a credit to Williams’ writing that I could simultaneously know how literally frail each of these characters are, playing a life and death game where they don’t know the rules and the rules seem to change, yet still be surprised and saddened when harm (or death) comes to a character. Or how much I really hate Dredd, the servant turned monster, preying on Otherland users/members for his own fun and games. Tad Williams again seemed to have fun with the simulation worlds, making alternate worlds of popular stories such as the previously-mentioned The Iliad and The Odyssey. There were at least two other worlds explored in this book. One seemed to be an “empty” world, what someone might consider the null space of code to be…since the Otherland network is only code, after all, it does make some sense that the users (our heroes and our villains) would sometimes find literally empty space. There was another world, a world of a house, the reference I didn’t connect (if there was a literary reference, which I suspect that there was). Still, the worlds all felt real, were able to bring me in. This is especially true for the Trojan War. I have long been a fan of Greek mythology, and it was a fun but unexpected surprise to spend so much of this book in that world…at least, that simulated world. The audiobook was great to listen to, if the narration was slightly slow. I listened to it slightly sped up (using the 1.5x feature for spoken word playback on my iPhone) and it seemed perfect. George Newbern does a great job making the characters come to life. Where some narrators can seem flat or one-note, he always makes it clear which character is talking, and further engages the listener by taking on the exclamation, the feeling of the words. If someone is surprised, for example, his voice lets you know it, you don’t have to rely solely on supporting descriptors. He brings the book to life. I’m looking forward to starting into Sea of Silver Light, which is queued up and ready to go. It’s a good bit longer than any of the other books in the series (~10 hours longer than this one), but that just means I’ll have to find more excuses to listen. Lincoln child begins Terminal Freeze by quoting all but the last couple sentences of THIS. It’s not exactly a scholarly article, more of a “fun science facts” story. But like Child there are plenty of other folks willing to proffer their own answers to this “mystery.” AboveTopSecret.com (a forum devoted to “conspiracies, UFO’s, paranormal, secret societies, political scandals, new world order, terrorism”) and AnswersInGenesis.org (a site about Young Earth creationism and a literal interpretation of the Book of Genesis) both have explanations for the seemingly flash frozen mammoth that fit into other “theories.” If Child’s solution to the mystery, this novel, wasn’t presented as fiction it’d be just as ridiculous. So ya, like I was saying, there are scientists in Terminal Freeze, and they talk about pseudo-scientific ideas, but this is just window dressing for the plot of a monster hunt. We might think of the “techno-thriller” as a kind of a modern gothic novel. Even as far back as the 19th century, Edgar Allan Poe and Jules Verne, were setting their “fantastic tales in the remaining unexplored regions of the world. By the early 20th the likes of H.P. Lovecraft, and John W. Campbell only had one unexplored continent: Antarctica. The same would be true for a modern audience but now that even Antarctica has been laregly de-mystified we’re having to place our monster horror stories in inaccessible caves and hidden military bases (at least that’s the route Terminal Freeze takes). The story is rather drawn out, with a number of blandish stock characters brought in seemingly only to be picked off one by one (which surpringly both does and doesn’t happen). The scientists, none of whom are particularly interesting, end up working with a local native, who was also co-incidentally a former soldier at Fear Base, and also a former junior scientist there, and also a co-discoverer of the original monster (back in the 1950s). Given those credentials you’d think then that he’d be absolutely instrumental in solving the mystery of what the frozen monster is and how it escaped. But no, he just gives a highly ineffectual and unrealistically cryptic warning (at the beginning of the novel) is promptly ignored – shuffles off the stage only to be brought back later, like Chekhov’s gun, jumbling around a bag of religious artifacts – which do nothing. Apparently the gun on the mantle was just a prop. Child added in an absolutely unnecessary batch of TV documentary people. The only reason I can think they’re there for is that it’d make for some good visuals should they make a movie of this novel. They’re all there when the monster in the ice escapes from the mysteriously melted ice. And of course their there when people start dying grizzly deaths as they wander off alone. But they don’t do much with those cameras and they end up leaving before the end. After finishing the novel I was kind of interested in finding out if any of the locations in this novel were real. In the book there is a mountain called “Mount Fear,” a glacier called “Fear Glacier,” and a “Fear Base” (a D.E.W. Line style military facility). It turns out that they all don’t really exist, they are all made up. One thing I did like about the novel was the discussion about the different types of ice. When the scientist are sitting around trying to explain how the creature in the ice escaped they briefly discuss different ways water crystallizes into ice, how these different types of ice are formed, and their differing properties. This briefly re-invigorates the mystery – but it is ultimately thrown away – discarded and replaced with a less than satisfactory explanation. 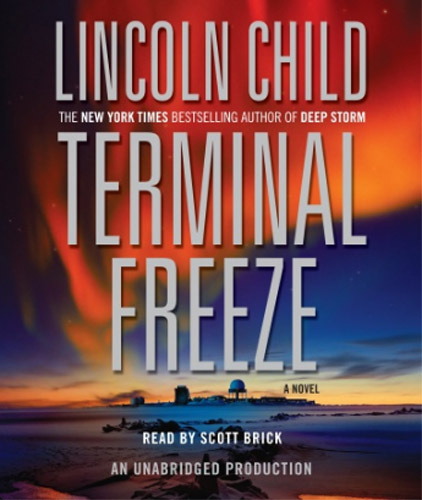 Scott Brick, who probably reads more books than any other audiobook narrator working today, does his best with what he’s given. The baddies come off badish, the heroes come off goodish, the monster comes off monsterish. The most interesting portion of the novel is actually a bit, almost completely tangential to the monster plot when an “ice road trucker” has to drive the survivors to safety. Brick works hard to make the cracking of the ice and the freezing cold compelling. And that’s the part of the novel is more believable. Daemon‘s success as a self-published novel that crossed over to attain mainstream success is a testament to its cultural relevance, especially among the technorati. Suarez, who moonlights (sunlights?) as a systems analyst, promoted the novel to the movers and shakers in the technology community, Its positive reception even among this tech-savvy elite suggests that Daemon has its finger on the pulse of technological developments and their implications for politics and culture. Daemon opens with the death of game developer Matthew Sobol, acclaimed developer of multiplayer games such as first-person shooter Over the Rhine and RPG The Gate, which bears a strong resemblance to World Of Warcraft. Some successful entrepreneurs leave money to their kids when they die, others give it all away to charity. Not Sobol. His legacy is the book’s eponymous daemon, a background process which through distributed computing has spread itself across the net and continues to carry out the developer’s will through a series of intricate commands. The capabilities of this daemon, and Sobol’s talent as a developer of artificial intelligence, become apparent when the police raid Sobol’s mansion in Thousand Oaks, California, and find themselves outclassed by a network of elaborate automated booby-traps, including an almost-sentient Humvee. The novel pans cinematically between several characters who, in one way or another, become embroiled in the daemon’s plot, which ultimately proves to be global in scale. Dramatis personae include police detectives, government agents, a gamer, a laid-off fashion reporter, a white-hat hacker, ad a convict. It’s not clear from the outset whether these characters will become heroes or villains as the story progresses, and even when battle lines are more firmly drawn most of them still defy simple caricature, exhibiting complex motives and emotions. The real show-stopper, of course, is the daemon itself, who possesses a high degree of intelligence and resourcefulness despite residing in lines of code. The novel’s conceit still demands the willing suspension of disbelief, but the concept and the technical specifics are so finely conceived and executed that the reader is left with a small but nagging suspicion that somewhere, sometime in a future that may be all too near, Daemon could become a reality. Suarez achieves this feat by investigating the wider political, economic, and social implications of a self-aware autonomous computer system. The living Matthew Sobol embedded many elements of his daemon into his multiplayer games, and several characters venture into these online worlds in search of clues. These scenes are among the strongest in the book, and they carry favorable resonances with both the Metaverse in Neal Stephenson’s Snow Crash and the simulator in Orson Scott Card’s Ender’s Game. Like the virtual reality elements in these novels, the online gaming sequences in Daemon succeed because they maintain a strong causal relationship to events in the “real” world. The action battle sequences in Daemon are high-octane, and like all good action sequences they manage to incorporate the book’s themes rather than standing as mere set pieces. 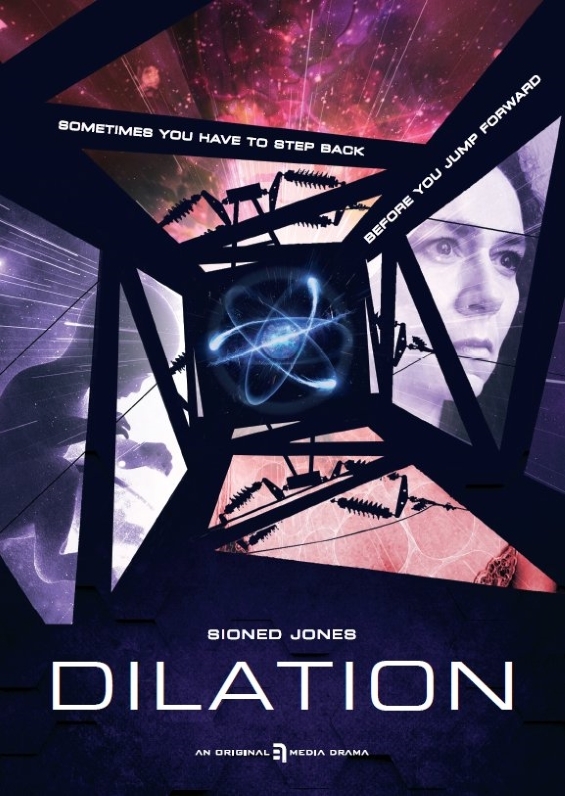 For the most part, the protagonists are fighting against computer-controlled contraptions. Nevertheless, I felt that these ultimately visceral and superficial scenes occupy too much space in the novel, and detract from the book’s otherwise deep and intellectually stimulating themes. Paramount Pictures has optioned the movie rights for Daemon, and I shudder to think that the cultural significance of this novel may be boiled away, leaving only two hours of car chases. The pacing of Daemon also leaves something to be desired. Suarez has revealed that a sequel is in the works, and the book’s cliffhanger ending promises an exciting continuation to the story. Lots of loose ends also remain dangling free, mostly in the arc of character development. The novel’s ending was certainly climactic, but it somehow failed to provide satisfactory closure. As I’ve said in other reviews, even books in a multi-volume series need to retain a high level of internal cohesion. 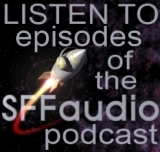 Jef Gurner’s narration for Daemon is spot-on. His performance is varied enough that each character’s unique identity extends into the aural sphere. Through some tricks of distortion, Penguin Audio has turned the dialogue of the daemon itself into a performance worthy of classic cinematic computerized villains. Fans of cyberpunk in particular should consider Daemon essential reading, but any science fiction fan looking for an intriguing and visionary techno-thriller should add this audiobook to their summer reading list. The novel’s fascinating themes make it worth slogging through some scenes of gratuitous violence and tugging in vein on a few loose plot threads. Daemon is an impressive debut novel by Daniel Suarez, hopefully presaging an illustrious writing career.